Dr. Ian Clark, paleo-climatologist in the Department of Earth Sciences, University of Ottowa, studies past climate from ice cores. The isotope ratio of 18O/16O is used as a proxy for temperature, and the CO2 concentration can be measured from gas bubbles in the ice. 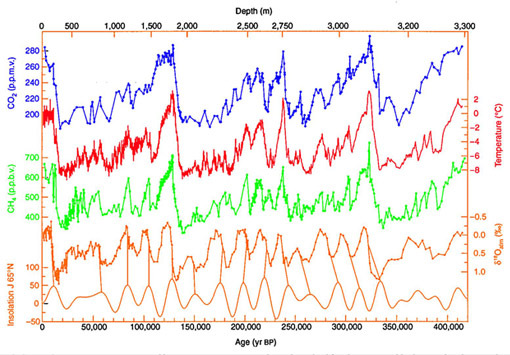 The above data is from Vostok, and Clark says that several ice core surveys show the same thing. The illustration was sketched from data presented by Durkin. The fact that the temperature increase precedes the CO2 rise would suggest that the temperature is not driven by the CO2 rise, even though they may be coupled. The increase in CO2 from about 200 to 280 ppm during its rise is comparable to the increase from about 315 to 380 ppm since 1958, and during the time the CO2 was rising, the temperature increased about 0.15°C and then dropped 0.05°C . 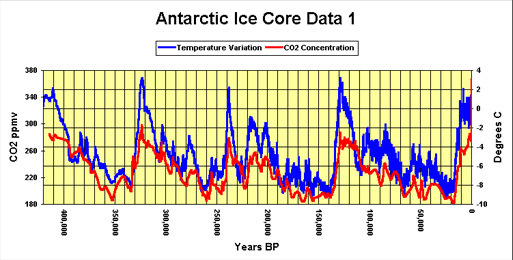 The Antarctic ice core data from Vostok for the past 420,000 years certainly shows a strong correlation between temperature and CO2 concentration, but the above plot lacks sufficient resolution to show that the CO2 peaks lag the temperature rises. The data is from Petit, et al. The above set of plots is from Wikipedia and also represents data from Vostok. Though the CO2 levels lag the rise in temperature and peak after the temperature starts to drop in the natural records above, we know on physical grounds that the CO2 does always exhibit the greenhouse effect and that rising CO2 levels make the temperature higher than it otherwise would have been. You can beam infrared radiation through a volume of CO2 and clearly measure the absorption associated with exciting the vibrational levels of the CO2 molecules. This does not happen with the dominant N2 and O2 molecules in the air because they are symmetric and don't absorb in the infrared. The natural cycles that have driven the temperatures in the past have incorporated that greenhouse effect and have collectively determined the climate. That is to say, the temperature changes and CO2 changes were not independent and were both determined by natural causes. The concern of the present era is that enough human-origin CO2 is being added independently of those natural drivers that it is tipping the balance of climate to higher temperatures.